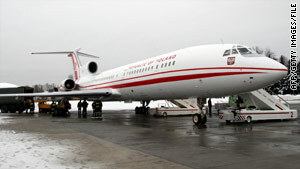 Experts say the crew of the Tupolev-154 did not have updated weather information. Moscow, Russia (CNN) -- Russian and Polish aviation experts have ruled out any emergency or equipment malfunction as the cause of the crash of Polish President Lech Kaczynski's plane in Russia last month, killing him and 95 other top Polish officials and dignitaries. But there were people in the cockpit who were not members of the crew, the investigation found. The people have not been named. The crew also did not have up-to-date information on the weather in Smolensk, Russia, where the plane crashed, investigators found. There was heavy fog in the area at the time. And the crew appears to have been relatively inexperienced. "The air traffic controller at Smolensk airport ... warned the crew on two occasions that there was fog at the airport, visibility was just 400 meters, and the conditions did not allow the airport to receive the plane," said Alexei Morozov, head of the technical commission of Russia's Interstate Aviation Committee. "Our technical commission has unequivocally established that neither a terrorist act, nor an explosion, nor a fire onboard, nor a technical failure can be blamed for the disaster. "The engines of the plane were running until the moment it hit the ground," IAC chairwoman Tatyana Anodina said at a news conference in Moscow on Wednesday carried live by Russian state TV. "The airport and its equipment had been suited for accepting various types of planes. ... The Terrain Awareness and Warning System (TAWS) was properly functioning, and provided the necessary information to the crew. The GNSS navigation system was switched on and functional too," she said. "It was also established that there were people in the cockpit who were not crewmembers. The voice of one of them has been precisely identified, while the other, or others, will be further identified by the Polish side," she said. The Polish news agency PAP identified one of the voices as belonging to Andrzej Blasik, commander of the Polish Air Force, according to Russian state TV. PAP cited an unnamed source close to the investigation. It is not clear when during the flight the passengers were in the cockpit or whether they had left by the time of the crash. The joint commission of Russian and Polish experts was formed April 10, the day when the plane carrying Kaczynski, his wife, Maria, and other top Polish officials crashed near Smolensk. "The airplane was in perfect order before takeoff," Morozov said. When the Polish Tupolev-154 entered Russia's airspace, the crew was repeatedly warned that bad weather conditions made landing impossible. Morozov also said the Polish Air Force crew did not have proper training for its pilots or clear instructions on how the Tu-154's four-member crew must interact. "The crew did not undergo regular training on simulators, learning to interact and to deal with emergencies. The crew was formed a few days before the flight," he said. The Tu-154 captain's flight experience was 530 hours, the co-pilot's 160 hours, the navigator's 30 hours and the flight engineer's 235 hours, the joint Russian-Polish commission established. A commercial pilot normally needs at least 1,500 hours flying to become a captain and get an air transport pilot's license, while a first officer needs 230 hours, said Gideon Ewers, a spokesman for the International Federation of Airline Pilots' Associations. A pilot usually cannot become a captain without such a license, and it can take three to five years to rack up the necessary 1,500 hours, Ewers said. But military pilot training is different from commercial pilot training, he added.